What role does diesel play in the 2030 vehicle mix? As diesel cars and vans continue to offer tangible benefits to consumers, they are here to stay – now and in the future. The Paris Agreement and the EU’s 2030 Climate & Energy Framework will require steep cuts in CO2 emissions from transport. Currently, 25% of all EU greenhouse gas emissions come from transport, and 40% of this comes from passenger vehicles; making a switch to cleaner powertrains inevitable. Electric vehicles offer clear benefits in urban areas as they do not emit pollutant emissions at the point of use and therefore do not affect local air quality. Electrified vehicles, such as hybrids, are also zero-emission capable in urban areas. As a result of climate change mitigation and air quality policies, the vehicle mix of 2030 will be markedly different from the one we have today. Increasingly low battery costs will make battery-electric vehicles a more viable option for consumers. The automation and digitalisation revolution will mean that more people will- slowly but surely- move towards shared mobility. The transition towards low- and zero-emission mobility is not, however, without obstacles. We can also expect this transition to be gradual, rather than an overnight change. New powertrains, such as battery-electric and fuel cell-electric vehicles, are coming of age and becoming more cost-competitive, but new infrastructure is needed to improve their attractiveness and increase market uptake. Underlining the complexities of this challenge, the European Commission estimated in 2017 that without new measures, 90% of vehicles driving on EU roads in 2030 would still run on an internal combustion engine (ICE) only. In the interim, the most likely dominant powertrain in new cars sold in 2030 will be hybrid vehicles that offer lower CO2 emissions than conventional diesel and petrol vehicles. These vehicles typically combine a diesel or petrol engine with an electric motor. At low speeds, they often use only the electric motor, and their regenerative brakes convert kinetic energy to electric power, making them highly economical and climate- and air quality-friendly for the typical ‘stop-start’ driving in urban areas. Hybrids recharge their batteries with the help of the conventional ICE, and therefore are not reliant on charging infrastructure. As such, their deployment does not face the same infrastructural challenges as battery-electric vehicles do in the coming years. In many countries, users of hybrid and plug-in hybrid vehicles also enjoy lower taxation rates than conventional vehicles. Moreover, for longer distances, hybrids as well as plug-in hybrids can still rely on their ICE without the need to recharge. At the same time, in urban areas, where it is easier to deploy charging infrastructure due to the higher population density, the share of battery-electric vehicles is likely to increase dramatically in the years leading up to 2030. 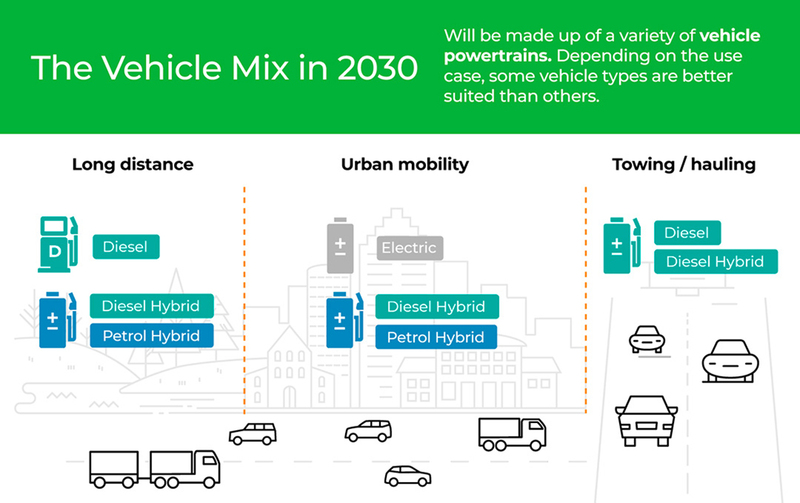 Therefore ultimately, the 2030 vehicle mix will be far more diverse than it is today, and be made up of fully electric vehicles, as well as hybrid and plug-in hybrid petrol and diesel engines. Each will have its own advantages based on the different use-cases and geographical location. Where in Europe can I drive my diesel car? While urban access regulations may seem to restrict where you can drive a diesel vehicle, modern Euro 6 models will continue to be welcome in most cities across Europe. If you are planning on driving through Europe, you may be concerned about the increasing number of cities announcing restrictions on diesel vehicles. To improve air quality and reduce emissions, many cities are setting restrictions on what vehicles are allowed to be driven where and when. We explain what this will mean for drivers throughout Europe. The EU and emissions regulations Since the early nineties, the EU has continuously tightened emissions standards set for car models and other vehicles in an effort to combat increasing pollution. Each set of standards from the first to the latest set in 2017 (Euro 6d-temp) imposed limits on the total amount of certain exhaust gas emissions from a car, specifically: carbon monoxide, hydrocarbons, nitrogen oxide and particulate matter. A key objective of these emissions standards is to improve air quality. Some cities are nevertheless facing some persistent pollution problems and are also taking local action to improve air quality. Many urban areas are transitioning to zone restrictions and bans of older, more polluting cars that fall under earlier Euro emission standards in order to encourage the adoption of cleaner cars such as Euro 6 models. Urban access regulations While vehicle emission standards are the same across the EU, individual cities have a range of different restrictions, zones and plans for the future reduction of emissions. Low Emission Zones (LEZs) within cities where access is limited or even restricted for the most polluting vehicles, are an effective measure to improve air quality. These zones can enforce permanent access restriction, car-free days and alternating day or hour restrictions depending on the classification of the vehicle. Drivers can still choose diesel and contribute to improving air pollution, while also complying with local restrictions. We have compiled an overview of urban access rules in six key European cities to demonstrate that driving a diesel in Europe is not as complicated as it may at first appear: London, United Kingdom Brussels, Belgium Stuttgart, Germany Paris, France Milan, Italy Barcelona, Spain The Urban Access Regulations website provides comprehensive information on urban access regulation schemes, including urban road user tolling, LEZs and other access restriction schemes across the EU. The European Consumer Center also provides an overview of LEZs in EU Member States for people driving across the EU. Euro 6 models: the diesel of the future Local restrictions and access regulations vary from city to city. The EU has no fewer than 561 different measures or schemes across Member States to date. A recent study released by the European Commission noted that this “there is a general lack of understanding of urban vehicle access regulations”, and leaves many citizens with diesel-powered vehicles confused about when and where they can drive. While differences in local and national priorities may halt EU-wide legislation from taking effect, there is work being done at a European level to provide vital planning, stakeholder consultation, evaluation methodology, enforcement and design guidelines for cities. Drivers can choose new diesel models and contribute to improving air pollution, while also complying with local restrictions As time goes on, the EU will continue to prioritise reducing air pollution in order to have a positive impact on European health, life expectancy and economic costs. Changes to urban access regulations across the EU aim to increase drivers’ awareness of the impact that driving has on the environment and encourage the adoption of cleaner diesel vehicles such as Euro 6d-temp. In the coming years, most urban access regulations are set to be tightened, making Euro 6 the diesel of the future for cities, Member States and the EU. Where in Europe can I drive my diesel car? Are diesel engines going to be banned? Full electrification powered by renewable sources is a long way from mainstream adoption, but diesel continues to represent a viable option for drivers now and in the future. We show you why In the past decade alone, diesel engines have made great strides in improving their efficiency. This has resulted in fuel cost and environmental benefits for drivers and wider society. However, the recent ‘dieselgate’ scandal, which has been followed by news headlines about national and localised restrictions on older diesel vehicles, has led to confusion surrounding the future of the diesel engine. Here you can find a timeline of diesel’s most important past and future milestones, as well as information on the many technological advancements that have helped reduce vehicle emissions. download the infographic The benefits of opting for diesel powered vehicles remain the same – they provide great fuel economy and are a cost-efficient way of decarbonising road transport. Modern diesel vehicles can also be comparable to petrol engines in terms of their nitrogen oxide (NOx) output. Diesel cars that meet current Euro 6 standards on emissions performance will continue to offer an important choice for drivers. As acknowledged by the GEAR 2030 High Level Group in their report on the Competitiveness and Sustainable Growth of the Automotive Industry in the European Union, combustion vehicles will remain an important part of the fleet to 2030 and beyond. Are diesel engines going to be banned? How modern diesel engines are helping reduce motoring’s impact on local air quality A combination of breakthrough emission control technologies have lowered NOx and particulates, making modern diesel a responsible choice for an urban driver. What do you need to know about urban air quality? According to the European Environment Agency (EEA), air pollution is the number one environmental cause of premature death in the European Union. Sources of urban air pollution include industrial emissions, heating and road transport such as cars and trucks. Air quality is assessed by measuring a number of pollutants, such as ozone, nitrogen dioxide (NO2) and particulate matter (PM), whose values should not exceed certain benchmarks. While carbon dioxide (CO2) emissions play a role in climate change, they are not responsible for damaging local air quality. In Europe, Euro 6 standards define the maximum amount of those pollutants that vehicles may emit. In 2017, so-called Real Driving Emissions (RDE) tests were introduced to ensure that cars deliver low emissions when driven in the real world, rather than just in a laboratory setting. What impact do cars have on local air quality? Air quality is a serious issue and the transport sector has made significant improvements to reduce harmful emissions. Efforts are underway across the European Union to improve the efficiency of engines to move to zero-emission vehicles in the long term. If all urban motorists today drove existing new RDE-compliant Euro 6 diesel cars, then our cities would see a substantial reduction in NOx air pollution. In the near future, combustion-engine cars are unlikely to disappear from European roads. To minimise their impact on air quality, improvements are constantly being made to engines in modern vehicles. [caption id="attachment_416" align="aligncenter" width="1080"] Modern diesel engines combine great fuel economy with near-zero pollutant emissions[/caption] Despite negative public perception, diesel engine technology has evolved dramatically in recent years to limit air pollutants and reduce CO2 emissions. In fact, modern and cleaner diesel cars combine great fuel economy with near-zero emissions of ultrafine particles and nitrogen oxides, making them one of the most cost-effective options for reducing transport emissions in Europe. Here are some of the innovations in diesel engine technology that actively combat air quality problems: Diesel Particulate Filters (DPFs) remove 99.9% of particles coming from the engine, including ultrafine particles. Ceramic wall flow filters remove nearly all carbon particulates, including fine particles less than 100 nanometres (nm) in diameter. Since the Euro 5b exhaust emissions legislation was introduced in 2011, DPFs are effectively mandatory. DeNOx exhaust aftertreatment systems such as Selective Catalytic Reduction (SCR) and NOx traps further reduce and control tailpipe NOx emissions of diesel cars. In the SCR system, ammonia is used to convert over 70% (up to 95%) of NO and NO2 into nitrogen over a special catalyst system. AdBlue®, for example is a urea solution which is carefully injected from a separate tank into a diesel car’s exhaust system where it hydrolyses into ammonia ahead of the SCR catalyst. A growing number of diesel cars registered after September 2015 (predominantly Euro 6-compliant vehicles) are equipped with this technology. Oxidation catalysts remain a key technology for diesel engines and convert carbon monoxide (CO) and hydrocarbons (HC) into CO2 and water. How do we measure the real impact of motoring? Since 1992, successive Euro emission standards have set stricter limits on the amount of pollutant emissions a vehicle can emit, such as PM, NOx, unburnt hydrocarbons and CO. A European diesel passenger vehicle was permitted to emit 140 milligrams of PM per kilometre in 1992, but this number dropped to just 4.5 milligrams in 2014. In addition, NOx and unburnt hydrocarbon emission limits have seen reductions of more than 90% over the same period. [caption id="attachment_417" align="aligncenter" width="1080"] Since 1992, diesel passenger vehicles have seen a 96% drop in particulate mass output per kilometre[/caption] Measuring the real impact of motoring is dependent on the study’s location. For years, car emissions were measured only in a laboratory setting that aimed to simulate road conditions. These tests came under fire for exhibiting loopholes that were exploited in the now infamous ‘Dieselgate’ scandal. In 2017, the European Union introduced two new complementary tests to measure air pollutants emitted by cars in a variety of real-world driving conditions to avoid loopholes and measurement discrepancies. What emissions innovations can we expect next? European vehicle manufacturers and their suppliers lead the world in the development of state-of-the-art diesel engine technology. New diesel engines not only emit fewer pollutants that damage air quality, but also produce lower levels of CO2. Modern, cleaner diesel cars combine great fuel economy with near-zero emissions of ultrafine particles and nitrogen oxides, making them one of the most cost-effective options for reducing transport emissions in Europe. In the coming years, partial-to-full hybridisation of the diesel powertrain (e.g. with 48V technology or plug-in hybrid) in combination with advanced emissions control technologies will allow further reduction of both harmful pollutants and CO2 emissions. However, European drivers can already make a difference to local air quality in towns and cities. If all urban motorists today drove existing new RDE-compliant Euro 6 diesel cars (registered from September 2017), then our cities would see a substantial reduction in NOx air pollution. NOx and Particle Number (PN) emissions of RDE-compliant cars tested on the road are publicly available. NOx and PN emissions from the latest diesel cars are well within the Not-To-Exceed emissions area as shown below. [caption id="attachment_196" align="alignnone" width="1024"] The latest diesel cars have NOx and PN emissions that are well within the Not-To-Exceed emissions area[/caption] The ADAC in Germany provides a list of RDE-compliant cars already available on the market. Armed with this data and with further technological updates in the pipeline, drivers are well placed to make choices that will impact positively on the quality of air in their towns and cities.